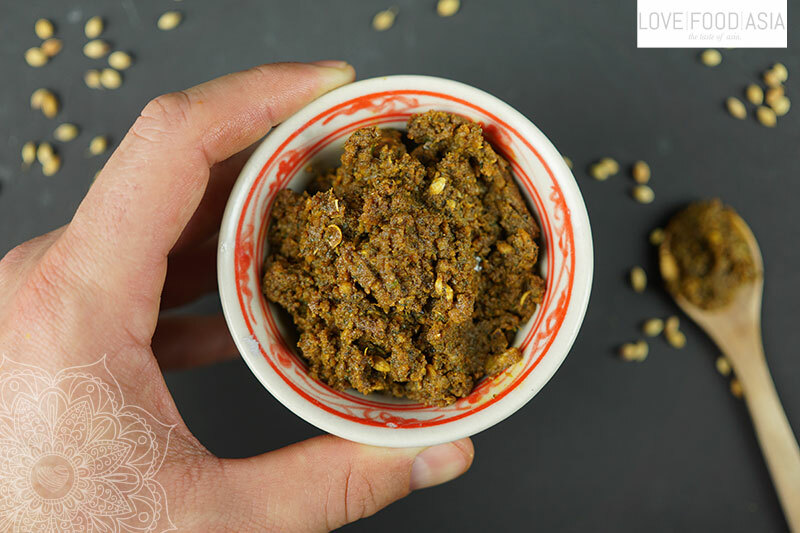 Homemade Korma Paste | Love.Food.Asia. The korma paste is an important ingredient in the Indian cuisine. It has its roots in the Mughlai cuisine. It is strongly influenced by the cuisine of Central Asia, the region where the early Turko-Mongol Mughal emperors originally hailed from, and it has in turn strongly influenced the regional cuisines of modern Northern India, Pakistan and Bangladesh. Nowadays Many meals in India have the korma base. The sauce is very creamy, sometime light and sometimes very spicy but always super yummy. In our very simple recipe we show you how to make your own korma paste without much effort. All you need is a pan, mortar and a food processor. In the beginning peel garlic and ginger. Put a frying pan on medium heat. Add all spices and lightly roast in the dry pan. After a few minutes (when the spices become brown and smelling delicious) remove from heat. Add toastet spices to a mortar and grind until fine. Transfer to a food processor and mix until you have a fine powder. Add remaining ingredients and mix until you have a smooth paste. Transfers paste to a jar and cover (airtight if possible). It keeps fresh for 4-6 weeks in the fridge.